Color(s): Brindle, sable, dappled; bi-color of black, chocolate, blue, fawn; solid of red and cream. Dating back to the 16th century, the Mini Dachshund was created to hunt hare. Originating in Germany, this breed is actually a Terrier. They gained notoriety in England when Queen Victoria became a fancier. Today Mini Dachshund's continue to be popular pets and are occasionally still used for hunting. A robust and muscular breed, the Mini Dachshund is short of leg and long in body. They possess an alert and intelligent expression. Mini Dachshund's are athletic, adventerous, and bold. The Mini Dachshund is affectionate, devoted, and loving. Due to their small stature and tendency to be snappish when teased they do best in a home with older, considerate children. 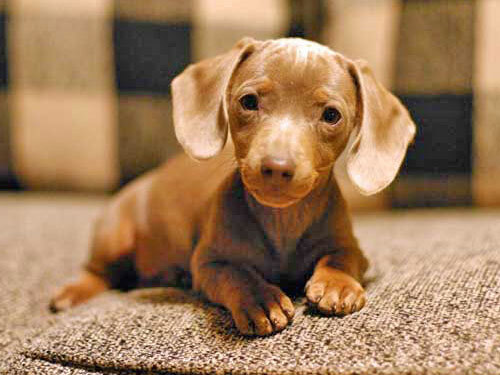 The Mini Dachshund breed is often aggressive or jealous of other pets. They are wary of strangers and will alert their family to visitors or out of the ordinary occurrences. Mini Dachshund's are relatively easy to care for. The Smooth and Wire-Haired coat varieties require weekly brushing to remove loose and dead hair. In addition, the Wire-Haired variety needs professionally trimmed twice a year. The Long-Haired coat variety requires daily brushing to prevent matting and tangling. Bathing should be done when necessary. The Mini Dachshund breed is prone to such health issues as obesity, hip dysplasia, spinal problems, epilepsy, bloat, and eye disease. The Mini Dachshund comes in three varieties: Smooth, Wire-Haired, and Long-Haired. The Smooth variety is sleek and short. The Wire-Haired variety is a double coat. The outer coat is short and hard, the under coat is soft and fine. The Long-Haired variety is elegant, glistening, slightly wavy, and is longer on the neck, chest, underside of the body, and behind the legs. The Mini Dachshund has a tendency to be stubborn and willful; making training a challenge. They are notoriously difficult to housebreak and the crate training method is recommended. Early socialization and obedience is a must. They will not respond to harsh or heavy-handed methods. Training must be done with firmness, fairness, patience, and consistency. Mini Dachshund's are ideal for both country or city living. They require sufficient exercise to prevent boredom and obesity. The Mini Dachshund enjoys securely leashed walks, indoor family play time, and off-lead play in a securely fenced yard.